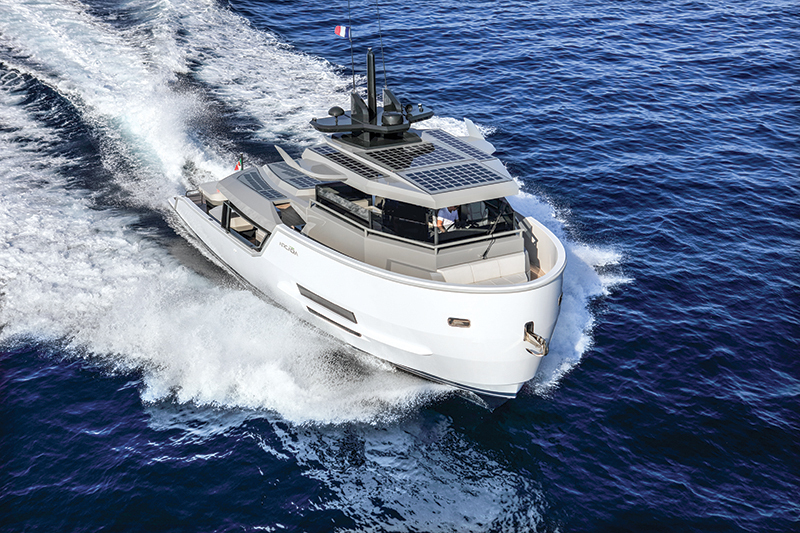 Arcadia’s Sherpa yacht has found its way to the U.S., and its exterior design ensures it will get noticed. An observer who saw the Arcadia Sherpa coming toward him would in no way expect what he would see once the 60-foot Italian-built yacht passed him. The snub-nosed Sherpa, which made its U.S. debut during February’s Miami International Boat Show, looks very much like a tugboat nose-on, and that impression is actually reinforced from aft, as the yacht’s open cockpit stretches for about half of the LOA — but this is definitely a luxury yacht, not a workboat. The cockpit, all of which is open and half of which is covered, occupies a spacious 538 square feet and includes an aft sun lounge for three people, two more lounges forward of the lounge that can serve as sofas and a C-shaped settee with a table forward of those, under an overhang. Twin L-shaped settees with tables can be substituted for the twin lounges, to create a conversation pit. It’s like having a dayboat attached to a pilothouse yacht. At the dividing point between cockpit and rest of the boat are four sets of stairs. Two of them, one each to port and starboard, go up to the sidedecks, which lead to the bow, where a bench seat gives folks a front-row view of the water underway. 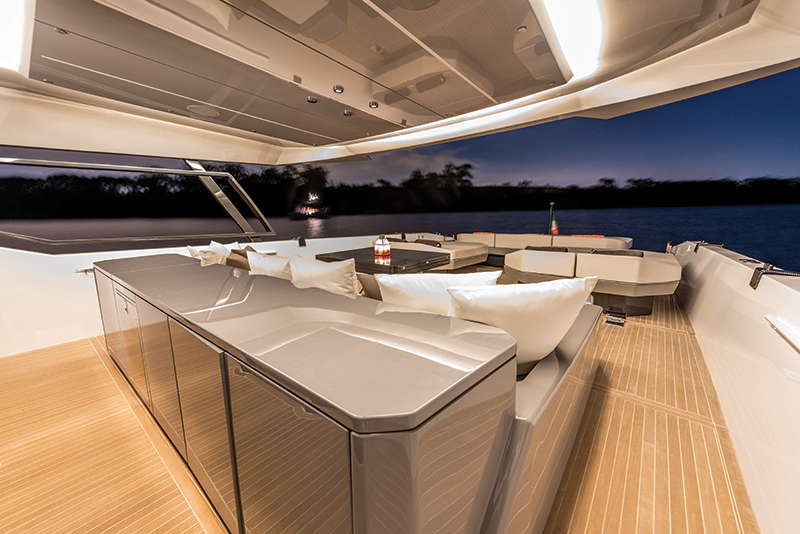 Stairs on the centerline lead to the sky lounge (flybridge), which includes a settee and a table, the helm and twin captain’s chairs, and a covered galley. 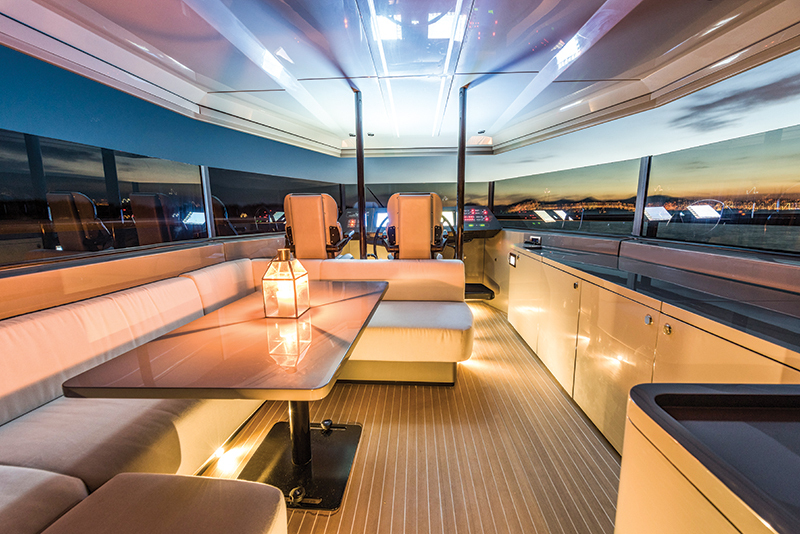 Windows all around the sky lounge can be closed in inclement weather or open on sunny days, giving the yacht an all-weather appeal and versatility. The fourth set of stairs, just to starboard of the sky lounge set, leads to the accommodations deck, which can be optioned with two staterooms or a master suite and a lower salon. Two heads are standard with either arrangement. 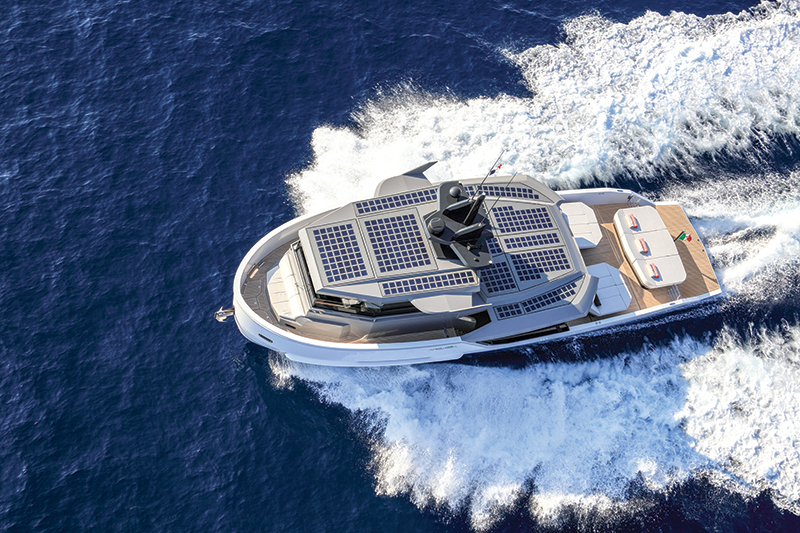 Solar panels occupy the sky lounge hardtop and the cockpit overhang, creating some of the power the yacht needs. A large garage under the cockpit can hold a tender and PWCs. 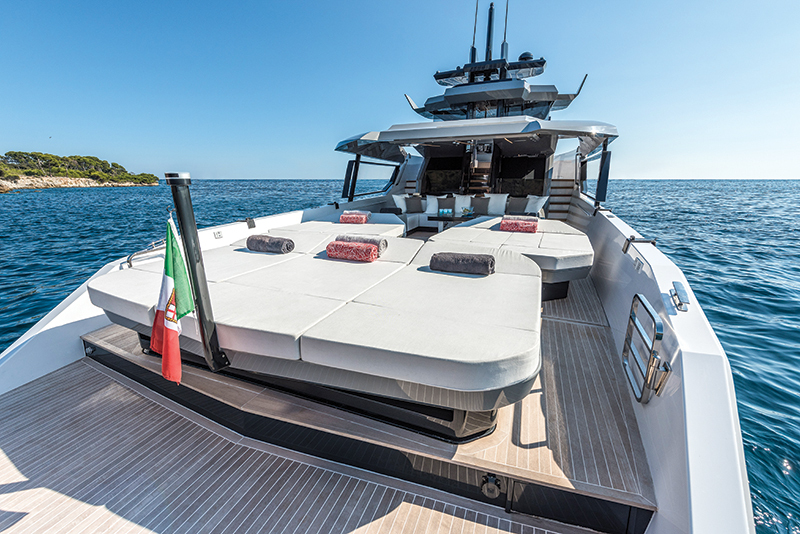 The Sherpa can reach a top speed of 22 knots with twin Volvo Penta IPS600 diesel engines.